Another Mother's day for me and I have loved every minute of being a mum even when times are tough I just look at Ethan and think I'm very lucky to have him and all mums face tough times and we are not alone. 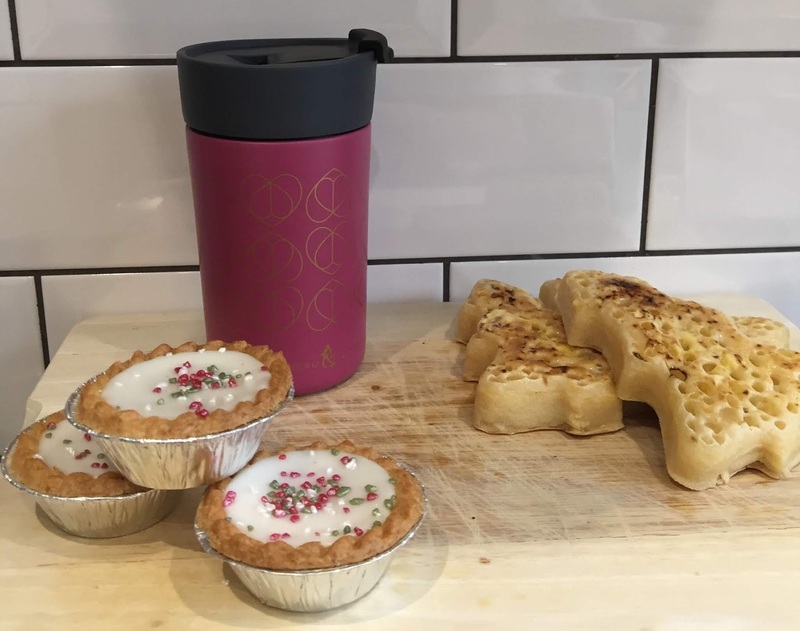 Mums need to be celebrated and this post is just to do that and I have got some wonderful brands on board this year which I am very excited to share with you. So what is Mother's day without flowers I hear you say well do not worry we have that covered with this gorgeous Bouquet from the ever so lovely bunches team. I love bunches flowers as they arrive in the most gorgeous displays and always feel the house with vibrant colour and scent. 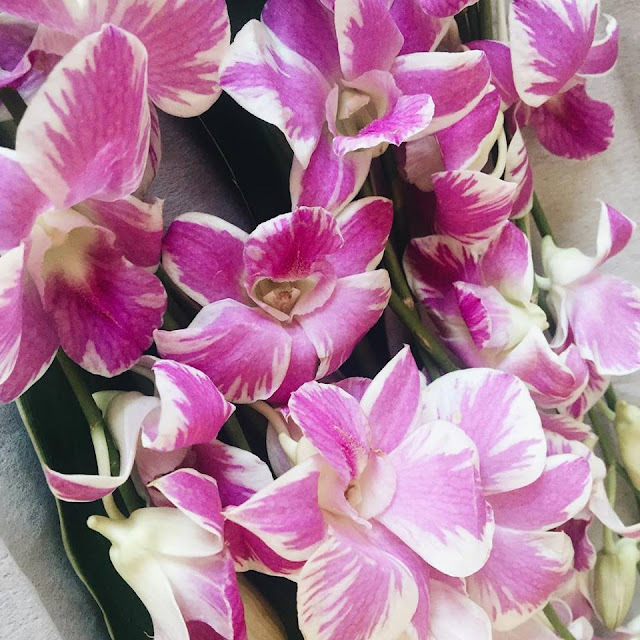 I just love having fresh flowers in the house and really rate bunches highly as you can tell from previous posts. This bouquet is 100% percent me I just love the soft pinks and the mix of peach with green bell foliage I really think this would make the most beautiful arrangement this Mother's Day. Bunches have also kindly given me a 10% off code when you order and you also get your petal points to when you place an order which then takes money off your next orders the more collect. The code is "rexg10" at the checkout. They have so many gorgeous arrangements it really is the perfect place to treat your mum this Mother's Day. Along with a gorgeous Bouquet Mums deserve pampering and this is taken care of by the Harriet over at Spacemask.com have the most amazing warming eye mask which totally transports you to a relaxing haven for a glorious 15 minutes and relieves stress and tired eyes and gets you ready for a restful nights sleep. Once you open the packet the mask is activated and ready to slip over your ears with the loops attached then lay back and relax and let the mask do its work on those peppers of yours. I love the funky design and fine this to be the perfect gift for Mothers everywhere. You can get a pack of 5 for £15 which is such a great idea and can be used either daily or as a weekly treat. The lovely Jess over at JessieBakes very kindly sent me a little box of goodies to share with you. 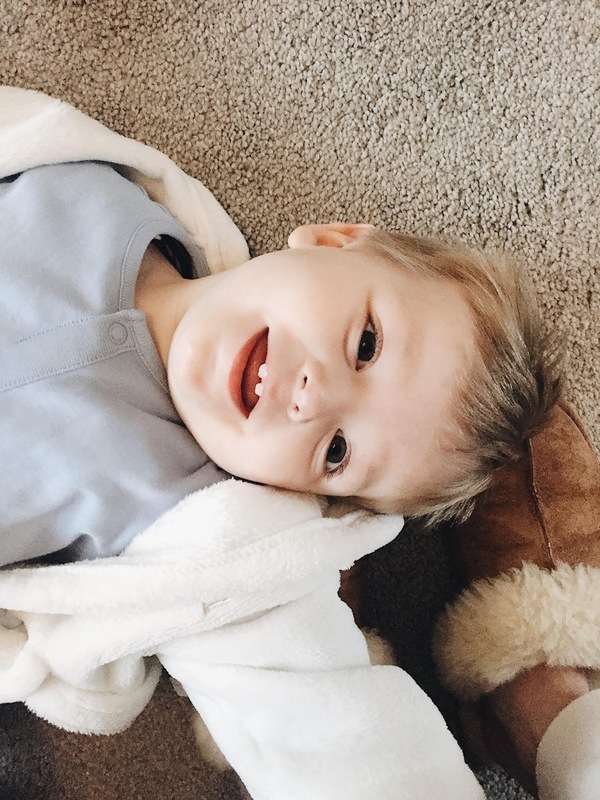 I am not a breastfeeding mum anymore as I stopped breastfeeding Ethan at 17 months however I thought it would be lovely to include this in my gift guide as I feel this would make a lovely addition for a breastfeeding mum for mothers day. These cookies are absolutely delicious and easy to make by just adding some coconut oil and water you are good to go. Jess also kindly included a HOTTEA MAMA Night Owl tea bag for me to try along with some super cute inspirational cards by Isabella & Us and a cute little scratch card. Along with these lovely goodies I was also lucky enough to work with the lovely Beau&Elliot I was kindly sent this gorgeous Oyster convertible lunch bag which is just the perfect print and the size fits so much in. I have been using this at work for my lunches and when we go out and about for Ethan's food and have had so many complements on it. I think this would make a lovely Mother's Day Gift. This is part of the Champagne collection and I really love the whole range. I love how you can have it two sizes and the detail is delicate looking. These beautifully displayed boxes contain a choice of Either Hand-Roasted Artisan coffee or Herbal tea from Hottea mama in a choice of two blends Get up and Glow or Night Owl. They also include Geranium, Lavender and Patchouli hand cream which I have used and it smells incredible. Two space masks and a choice of luxury chocolate in either Milk chocolate and Honey comb, White chocolate, Raspberry and Pistachio or Dark chocolate with fruit and nut. I mean if that isn't a luxury box of goodies then I don't know what is. If you would like to order your own head over to their Instagram or Website here. Then lastly I came across this lovely Jewellery brand after winning my E necklace on a fellow followers page and I think they would make the perfect treat this Mother's Day. Loollerybylocket are designed by Lucy a mother who produces hand stamped jewellery which is so delicate and beautiful. I never take my E necklace off and the quality is of a high standard and I feel the chain is the perfect length for me. Lucy has some lovely pieces if you are looking for that personal gift this Mother's Day. Before Christmas we were kindly gifted some Little Dish meals to try out with Ethan and I was blown away by how much he enjoyed them all. 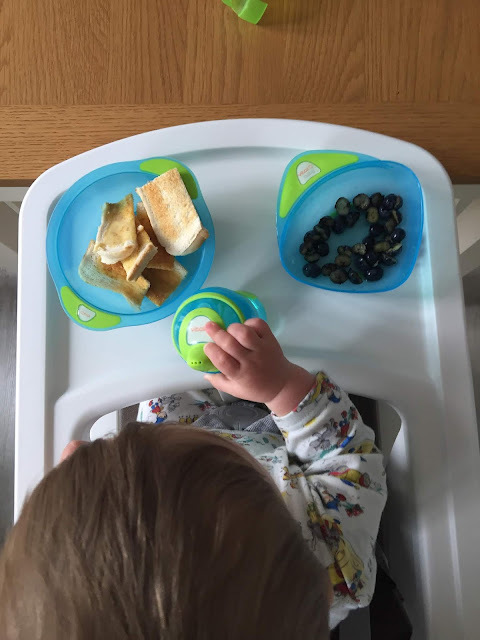 Ethan hasn't been overly keen on trying new foods since we started weaning last year but his taste seems to have changed and he has started to branch out and try new flavours. The meals we were sent are Little Dish fresh meals which can be frozen as well a kept in the fridge. This is perfect for busy families or a mum or dad stuck in a food rut like I was. Ethan was sent a section from Little dish and I think the pictures speak for themselves as to how much he enjoyed each one. All of the meals were easy to prepare and you can either put them in the microwave or in the oven to cook and they have no added sugars or preservatives which is great for us to know what Ethan is eating. They are low in salt and offer at least one of their 5 a day in each meal. Great source of protein and British meat and fish which is locally sourced. 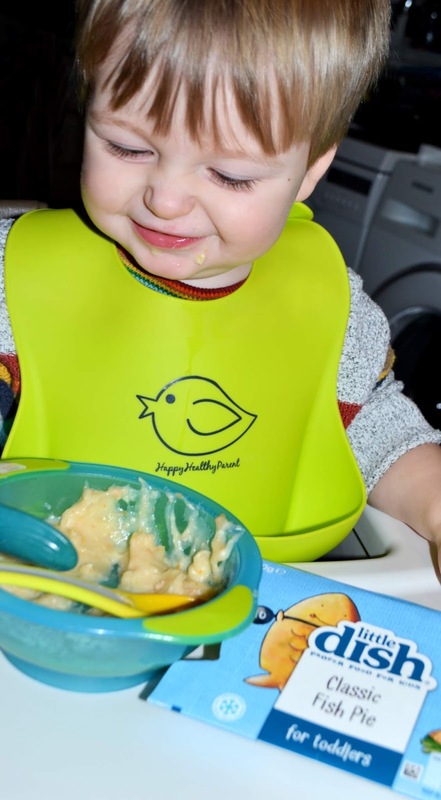 I found the meals smelt really good and Ethan was so excited to try them and it has been a great way of him feeding himself more and more and learning new fine motor skills. It is also nice knowing he is getting vegetables because they are not his favourite and I have struggled to get him to eat them unless mixed in with foods. Little Dish also worked with Lucy Jones who is a Nutritionist and Mum of two who helped ensure that all the meals are nutritionally balanced. Little Dish also sent us this super handy cool bag which will be great for shopping trips and picnics to ensure all meals are kept cool. Little Dish meals are available from your local super markets. Disclosure* I received these Item's as part of a collaboration all opinions are my own. 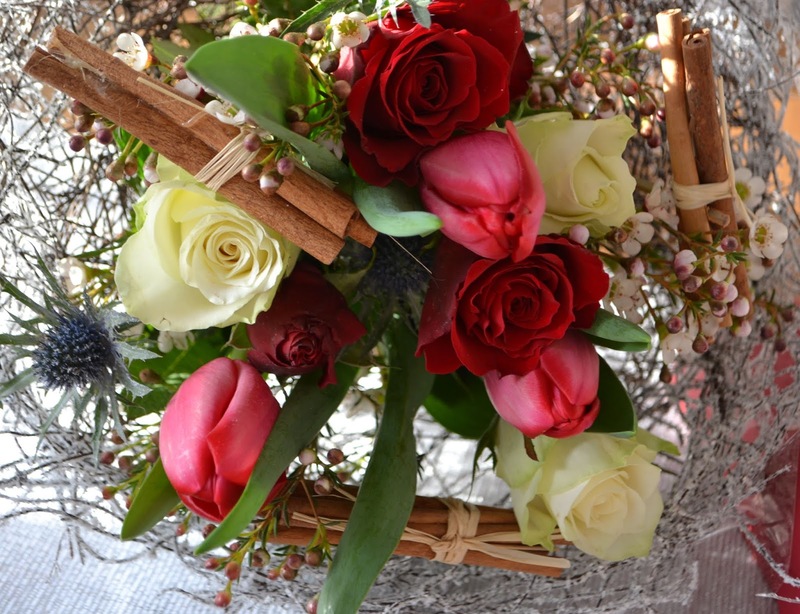 The Gift of flowers is always going to put a smile on someones face so why not make it a Christmas Bouquet from Bunches. I was kindly gifted this stunning Christmas Posey which has the most beautiful roses and tulips which are my absolute favourites and looks so perfect together with the snow dusted thistles and white wax flowers. The cinnamon sticks give a really festive feeling and the whole bouquet just says Merry Christmas in my eyes. As always Bunches never disappoint with the attention to detail. The gorgeous snowy brunches which nest the bouquet finish it off and makes a lovely table centre piece. You will receive your bunches bouquet in a sturdy box with water tub and flower food and you can even add a personal message to loved ones. They also offer 1st class Free Royal mail shipping for head over now to order yours. As I have mentioned in other posts Bunches offer a points system and each bouquet gives you points off your next one which I think is a great way to build up for a free bouquet. Bunches have a gorgeous selection of Christmas bouquet and gorgeous hampers for all loves ones this year so head over to their website and finished those last few presents off. With very few shopping days left till Christmas why not get the Coffee lovers in your life this super stylish coffee mug by Beau&Elliot. Beau&Elliot have kindly gifted me this new to the line gorgeous mug from their Champagne edit collection which I think you will agree is stunning. 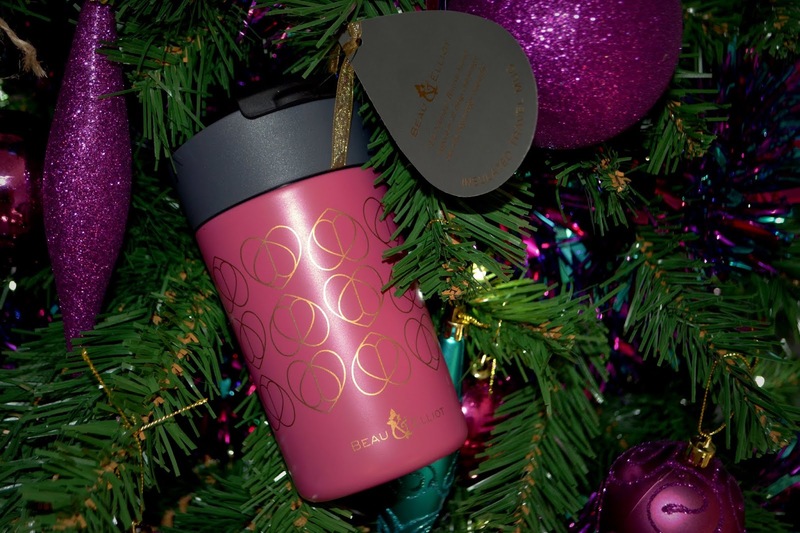 This travel mug comes in a section of colours from blush pink to this gorgeous Orchid, Teal and a Dove Grey. I'm going to be testing out mine over Christmas and will let you know my thoughts. This coffee mug means no paper waste and holds a regular sized coffee from all of your coffee shops which means you never have to go small. This coffee mug is made from stainless steel and has a great easy to use clip and sipping hole. I love how stylish this mug looks and think it would make a wonder gift for a family or friend who loves a good cuppa. I love the vibrant colours and they would be a great conversation starter in the office or on the tube. Mums can also use these while out with the buggy and look super stylish while doing their bit for the environment to. The attention to detail is just stunning and the colour palettes are to suit all tastes. The collection would make wonderful gifts for that special someone in your life this year. If you would love to have a look at more of the collection they have just recently launched a new website which I will link for you to browse the stunning collection and more. I hope this has given you a couple of gift ideas for loved ones this year. Disclosure* I received this Item as part of a collaboration all opinions are my own. Sleep is something every new parent talks about and hears about at some point in their child's life. 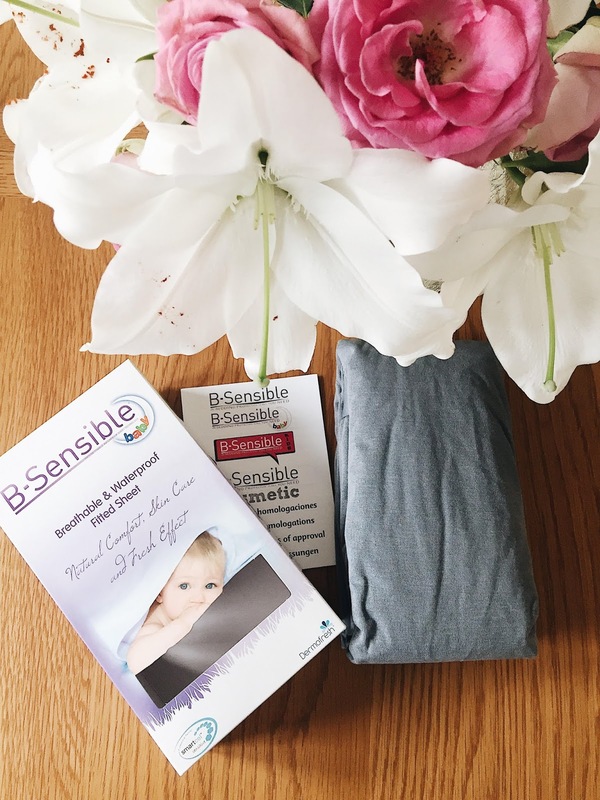 We were asked to review this breathable fitted sheet by B-Sensible and it has some amazing qualities I thought I would share with you. The sheet is fitted and goes on a cot bed and isn't loose or baggy which is reassuring when Ethan is sleeping at night. The sheet is also waterproof which is handy when he has a sip cup in bed I know his bed won't be soaked in the night he is decided to have a water party. 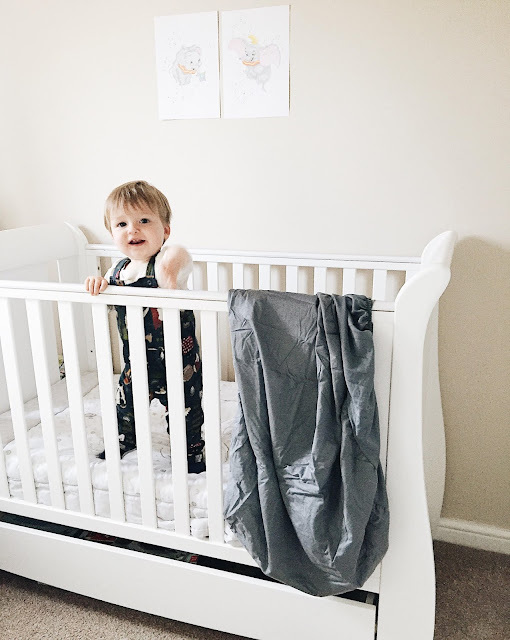 The sheet is made from natural and sustainable fibre which is great for children with allergies. 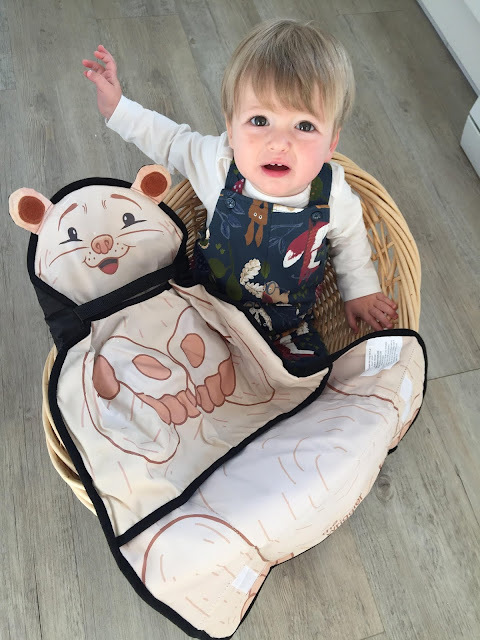 The material is super smooth and has a dust mite barrier which is great knowing your little ones are protected from these. The B-Sensible sheet is also machine washable and can be used in the tumble dryer which for a busy working mum is a great bonus. The sheet also has Dermofresh which is a new generation of textile which stops water particles passing through and is breathable and like a second skin. I have been really impressed with this sheet and Ethan has slept really well on it and hasn't overheated or been uncomfortable so I would really recommend it. 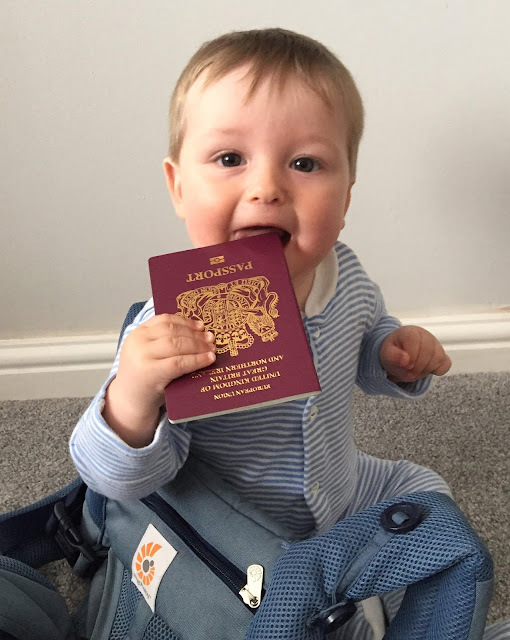 As you can see Ethan was so excited when this little guy turned up to help this mum get nappy changes sorted! Ethan sure is a wriggler when it comes to getting his nappy changed. He is like to different babies when the nappy and wipes come out. Sometimes he will lay happily and then other he is screaming and crawling off the mat before you have had time to put the fresh one on. I was very excited to give this a try and it is so easy to use and can be used from newborn stage right up to the potty training stage. I love how soft the material was when I laid Ethan on top and put his arms in the huggable teddy and then velcro them shut and the hand then go to the side to make a foot rest for the mums and dads to kneel on while changing. James and Aileen the founders of The Wriggler have really thought about the parents to when planning this new venture and the detail really doesn't go a miss. 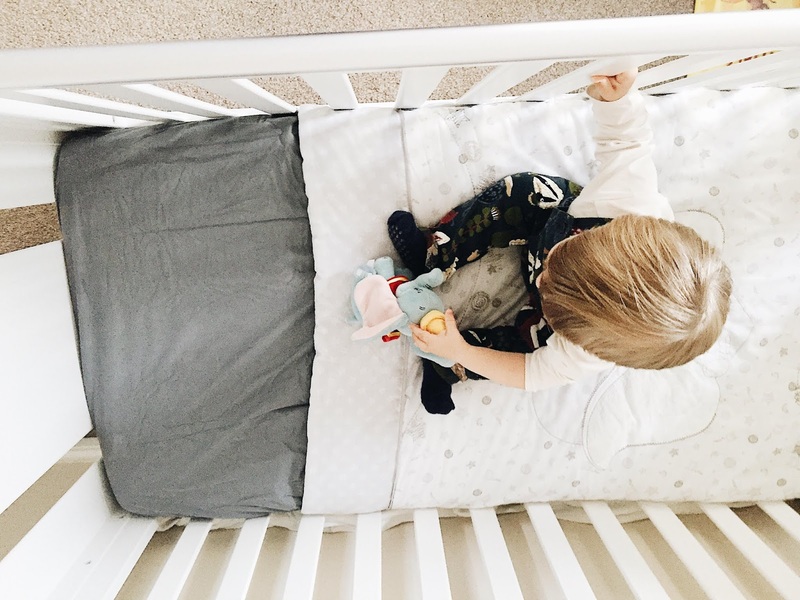 The material used is BPA and phthalate free and have been tested to a very high standard in the US and Europe to ensure even the sensitive of skins will be happy laying on this super soft changing mat. All the material is wipeable and can be used as a normal changing mat without the huggable arms with one easy movement. 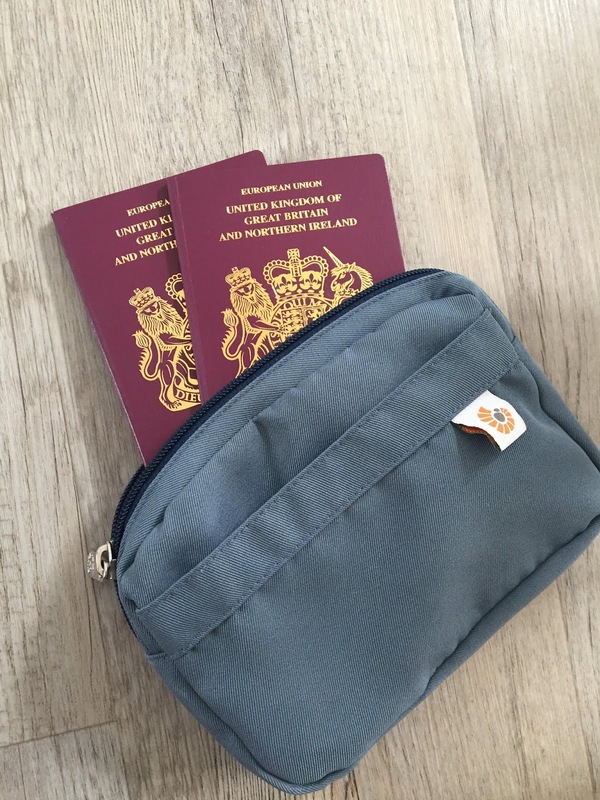 It also folds up to the perfect size to fit in youre changing bag of choice. 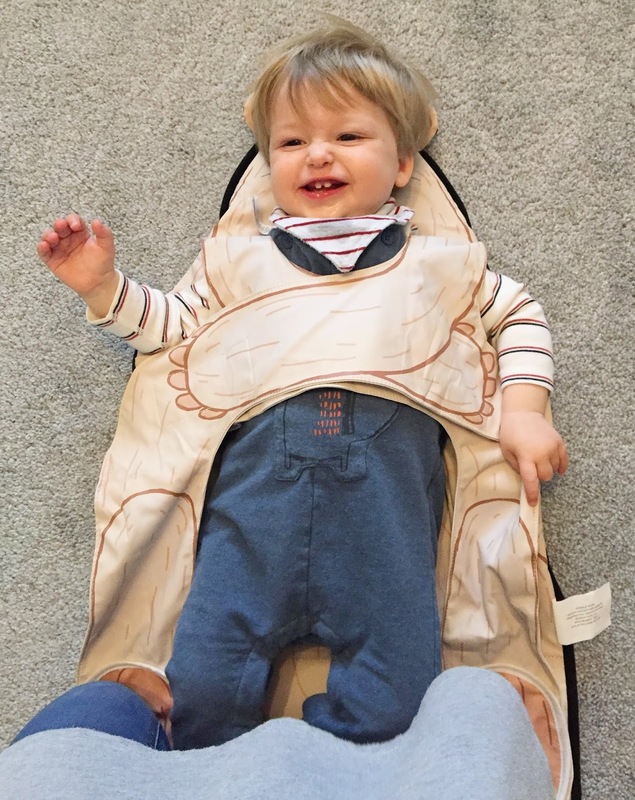 All in all I think this is such a great idea for babies who move around while being changed and it would be great for those moments in public changing rooms to for hygiene and safety. Disclosure* I received these Items as part of a collaboration all opinions are my own. 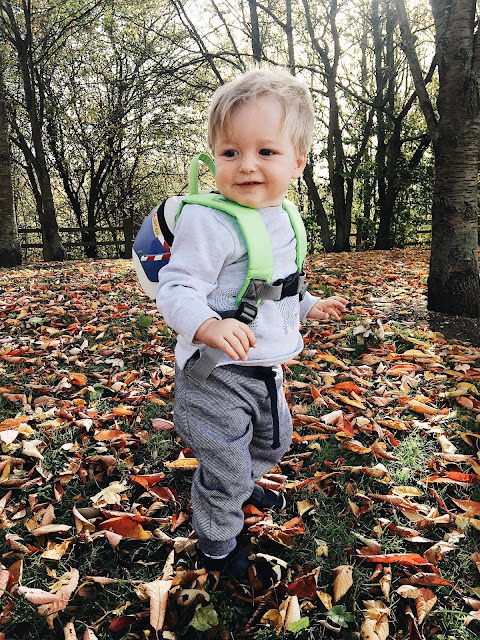 Getting out and about is something I have been doing since Ethan was born even if it is just a short walk to get Rex out or a longer woodland walk to dust the cobwebs off. I love being outside and taking the beautiful tones that all the difference season throw at us. I love Autumn and am so glad Ethan was an Autumnal baby because it really is a stunning time of year. 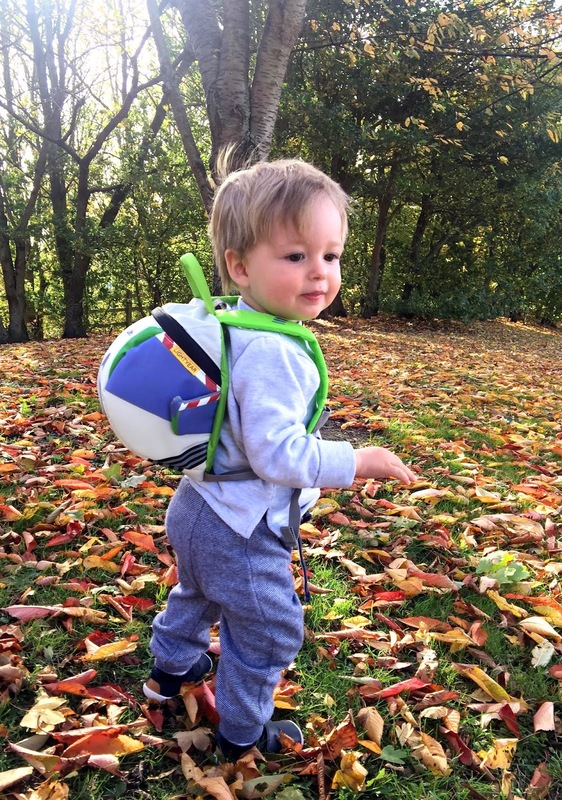 We were kindly sent this Backpack by Littlelifeuk as part of their Autumn is Awesome campaign. I choose the Buzzlight year one and think it really is the perfect fit for Ethan. 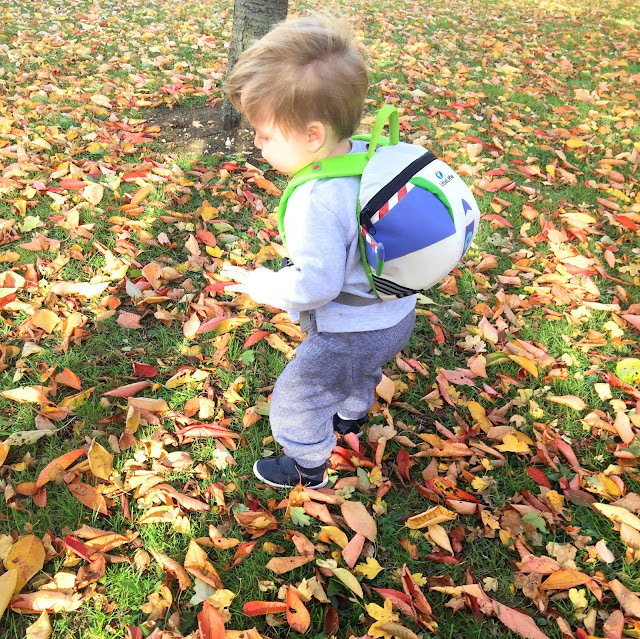 The backpack is very easy to put on and just goes over the shoulders like a normal backpack but then you have a chest buckle which keeps it from falling off your little ones when they are walking. I love the cute detail of the wings and the colours are so bright and eye-catching and I know this will bring a lot of fun on future walks the more confident Ethan gets. Ethan loves taking Rex out and he was so happy to be by his side rather than in the buggy so I think this way of getting around will be a real treat for him the more he starts to walk and gain confidence. There is a strap which connects to the top of the backpack and has a handle for the grown to hold to ensure your little ones are safely walking with you and the older they get they can just wear the backpack to put their little snacks or a few toys in. My little Buzzlightyear loved wearing his backpack and you can get one for your little ones to by heading over to LittleLife.com they have some really cute designs and the Buzzlightyear one is currently on offer but out of stock due to being so popular. Autumn is one of my favourite times of the year with the crisp leaves and gorgeous warm tones. 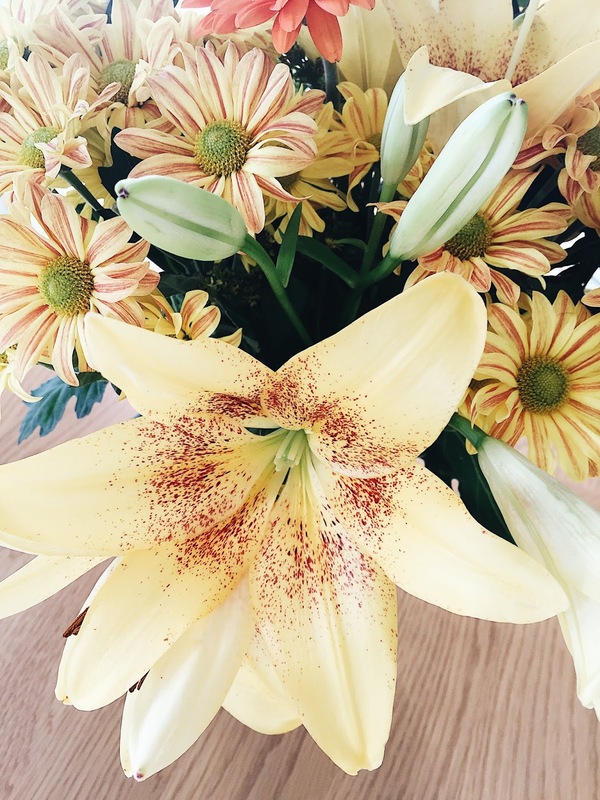 I love fresh flowers and when bunches laughed their gorgeous autumn collection I just had to see what they where like and I wasn't disappointed. Bunches stunning bouquets come loving packages and arrive fresh and all the lollies were closed and ready to open for me which made the bought last so much longer. The berries are a lovely touch and add a nice warmth to the arrangement. I love the mix of yellows and red and a few subtle green tones just to keep things fresh. Once the lollies had bloomed they opened up to reveal the most stunning red and orange detail which I hadn't seen in many I had bought before. 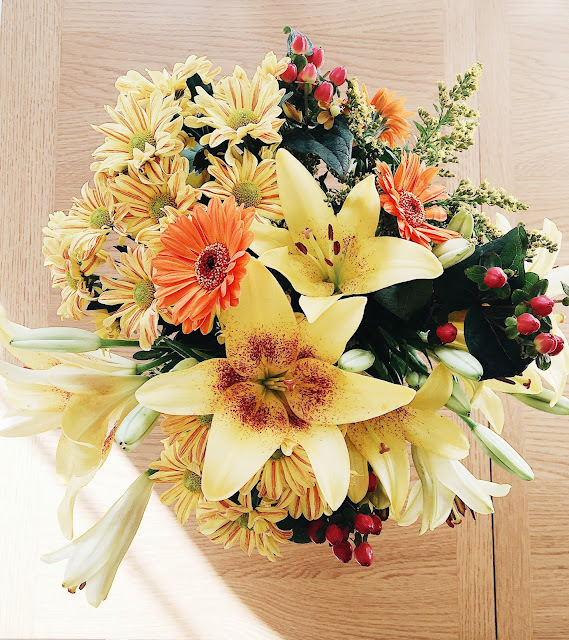 "A beautiful seasonal mixture of Asiatic Lilies, Germini and Chrysanthemums in golden orange shades." Bunches offer Free Uk delivery and 7 days freshness guarantee. Once you are signed up to Bunches.co.uk you can also collect points which come off your next bunch which I think is great if you are an avid flower lover. Perfect for any occasion and just brightens up any living space. 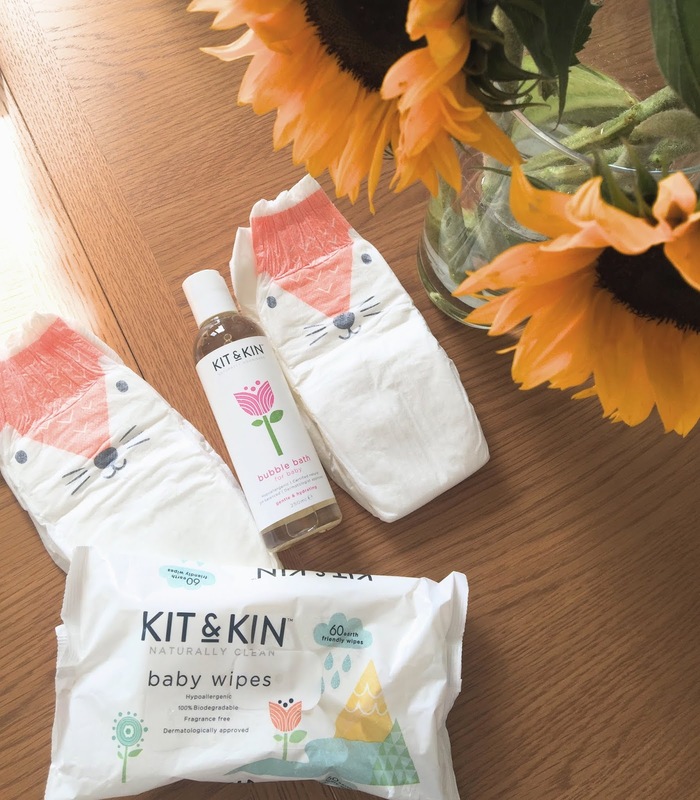 Recently we were kindly gifted these super fun and cute KIT&KIN nappies and wipes to try out. For those that did not know this is Emma Buntons range of nappies, wipes and skincare and I have to say I am really impressed with the quality and durability of both. Firstly lets just address this really cute print which is on the back of the nappy. Kit&Kin do other designs such as panda and tiger and a few more. I feel these nappies are the perfect fit and we have had no leaks which is a great bonus. 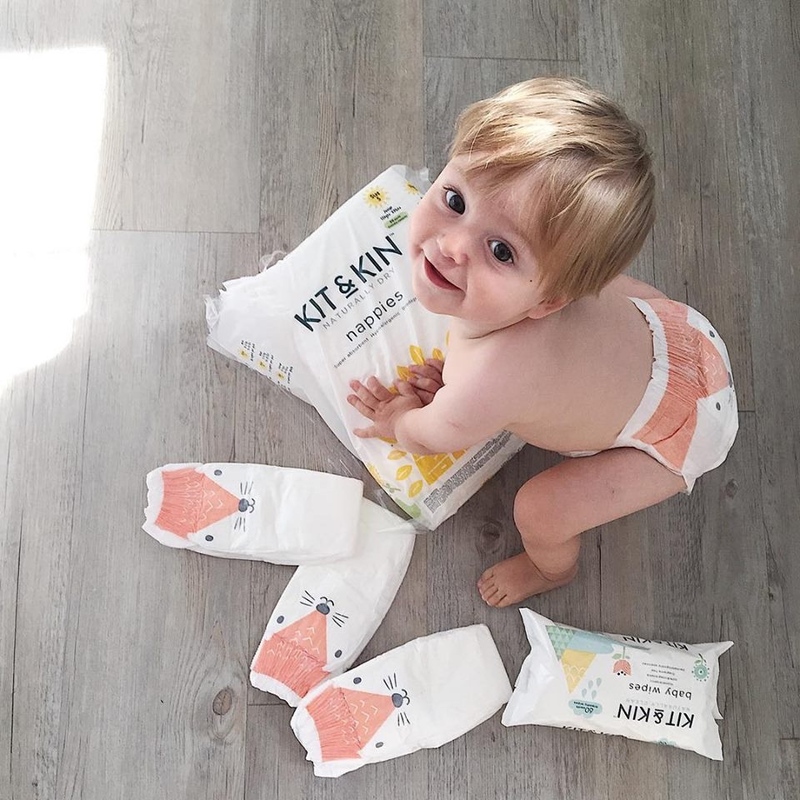 Ethan did not have a reaction when we switched to these which is due to natural materials and less chemical used in these nappies and wipes. The material's used are plant based and this means they are biodegradable which is perfect for the environment. They offer up to 12 hours and have a super comfortable cuff around the leg to prevent leaks. The wipes are nice and thick and have a slight texture which is great for wiping delicate bums and intimate areas, they are also moist enough but not soaking wet which is great when changing nappies and means you do not need half the pack for one nappy change. 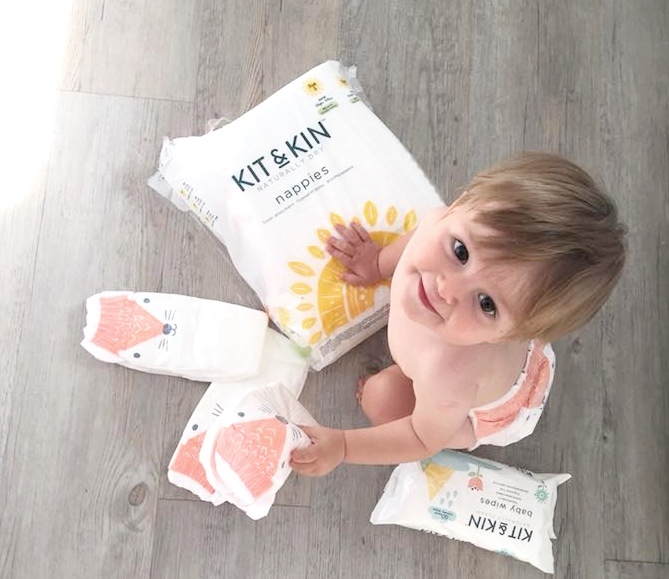 Kit&Kin do useful bundles of nappies and wipes and they also offer a trial service and a subscription service which is really handy and you know you will always have nappies coming. These Nappies and Accessories are also cruelty free and when purchased you are helping support a number of animals against testing and a lifetime of cruelty. I feel these are the perfect nappies if you have a love for the environment and want to keep your babies skin protected. I feel the price is a little steep compared to what we currently use but feel they are a nice brand if budget isn't an issue. The nappies came in a pack of 30 and the size is spot on for Ethan I love the cute packaging and attention to detail. The wipes are packs of 60 and are hypoallergenic and 100 Biodegradable with no chemicals or chlorine. The Bubble bath is such a gorgeous fragrance of mango,plum and strawberry. This bubble bath is also approved and certified by the soil association and is made without harsh chemicals. I love trying new products that will help keep Ethan squeaky clean. A few weeks back on the run up to Ethan's first birthday I was kindly sent these Gorgeous Natasha letterbox flowers which are just the most stunning pink Orchids. 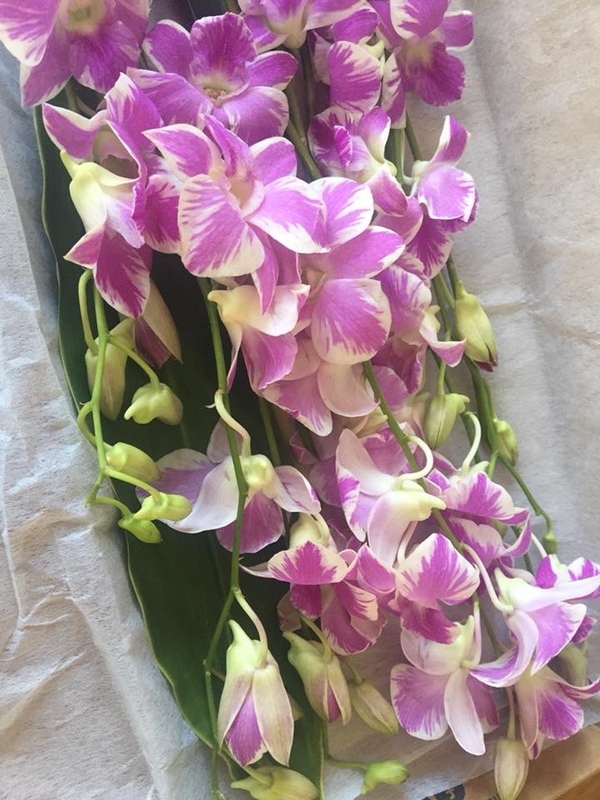 The Orchids smelt amazing once I had opened the box and got them in water they looked so beautiful and really brightened up the room. Bunches know how to do flowers and they didn't disappoint. I received these lovely flowers along with some goodies for Ethan for his birthday which he was delighted with. I find letterbox flowers such a lovely idea and a great gift if you want to surprise a loved one or even wanted that little pick me up for yourself each month. 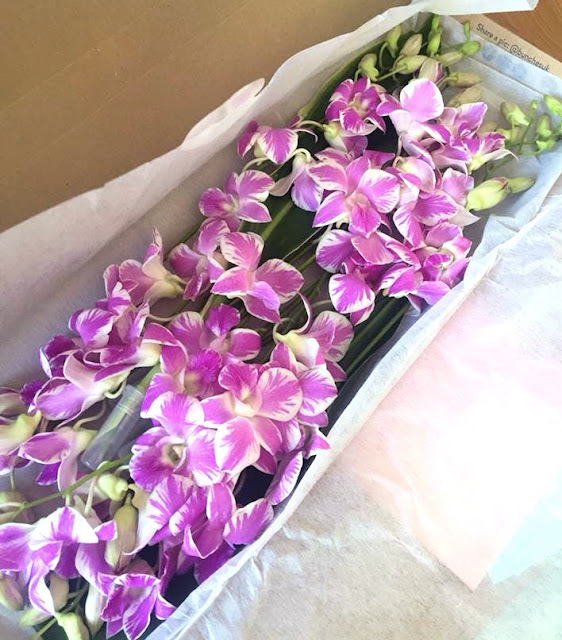 Bunches present their letterbox flowers by laying each stem with a water bulb to keep them hydrated, they are placed on luxury wrap to ensure they are protected and then placed in a letterbox shaped box and they are then posted through your door. I love the selection of letterbox flowers they offer as there is something everyone will love to receive. You can also earn posy point which our worth money off your next order so to me that is a sure win. Head over to the Bunches website and have a look at the gorgeous arrangements they have for yourself or a loved one. 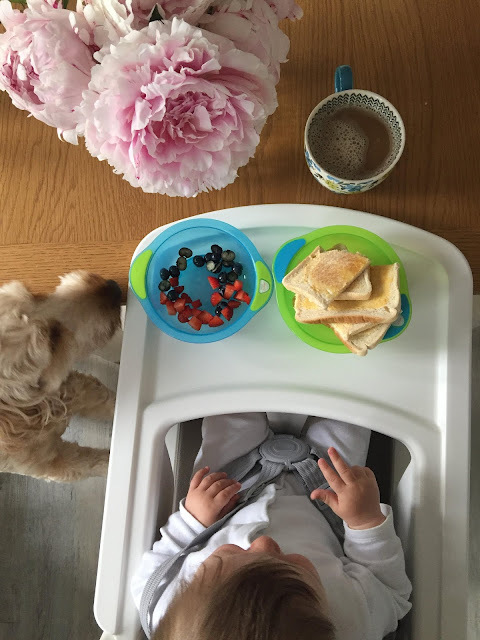 Breakfast time in our house has become a time where we sit down as a family together and share what we have been up to that day. Ethan is a little young to understand at this stage but it is nice to have him sitting with us at meal times. We were recently sent some Vitalbaby weaning goodies to road test and I am impressed with how they performed. Ethan enjoys having his berries in a bowl and will tend to pour the whole lot on himself or the tray but I'm sure he will get the idea soon enough. 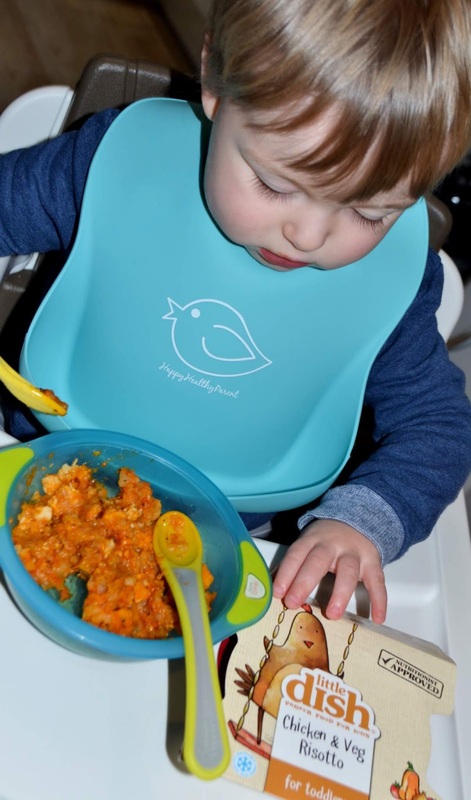 We were kindly gifted this colourful weaning selection and have loved putting them to the test of a weaning baby. 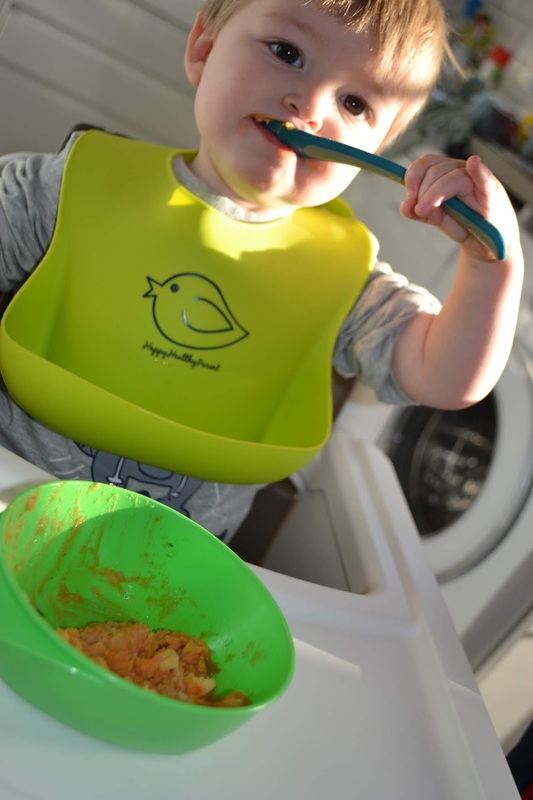 I love the weaning starter kit with useful storage bowls and a handy travel sized bowl and spoon set and travel beaker. The set of 5 soft colourful spoons are great for introducing your baby to solids and helping them adjust to the grip control. They are small in size which is perfect for little hands and they get just the right amount on the end of the spoon for little mouths. We haven't used the trap a snack pot yet as Ethan is more interested in putting his snacks on the floor and doest understand putting his hand in the trap snack pot just yet. 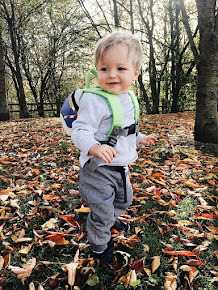 I think this will be great when he is a little older and we are out for an adventure and need to keep him occupied with food without the added mess. The unbeliveable bowl has been a great addition to our weaning journey as it has a suction attachment that clicks on to the highchair or feeding surface and keeps the bowl in place. Unfortunately the suction isn't strong enough on our highchair and Ethan has managed to pull the bowl and suction base off each time I have gone to use it. I will try it out on other surfaces as he gets older and report back. 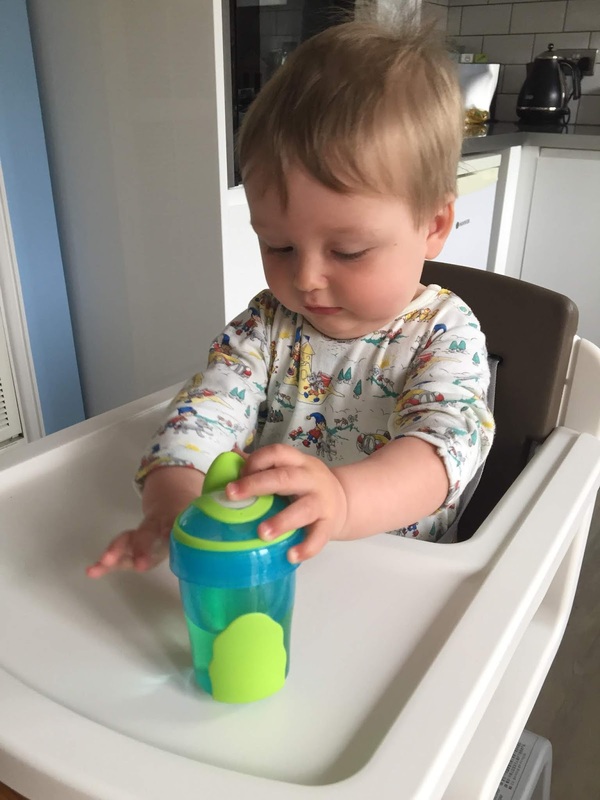 Ethan has enjoyed exploring the sappy cup that is included in the weaning starter pack and has started wanting to hold it himself and work out how the water comes out. The size is great for him to hold himself and it has grip pads to help it not slip out of his hands. 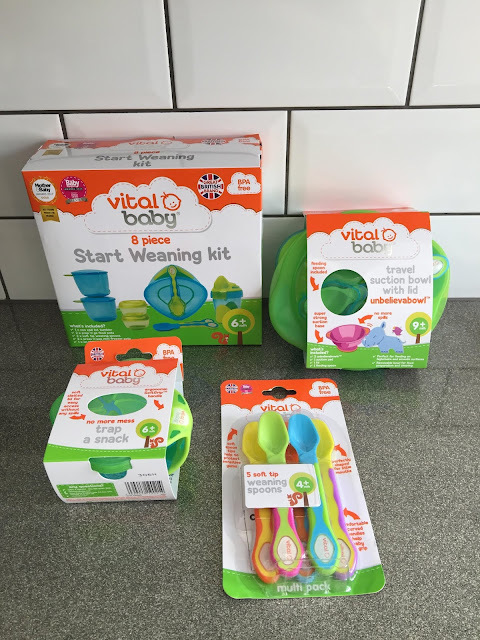 I think these are great products for mums and dads starting out with they're weaning journey and I have found Ethan has enjoyed using and playing with these fun and colourful feeding tools. Disclosure* I received these products as part of a collaboration all opinions of the brand are my own. Ethan and I were kindly sent this amazing ErgoBaby Omni 360 Cool air mesh carrier in Oxford Blue for our recent adventure to my mums. Ethan had never been on a plane before so I was very excited and a little nervous but thanks to this carrier the journey and our time their was fun and much easier. 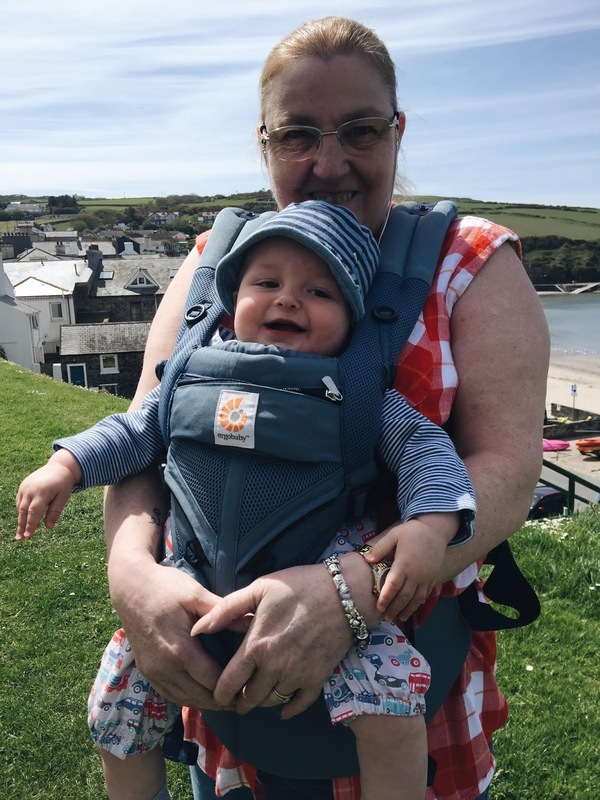 Ethan was really happy to be in the carrier and I have worn him since he was newborn so he is used to being carried for dog walks and walks around our hometown but he never had the option to face outwards in the other carrier I used. 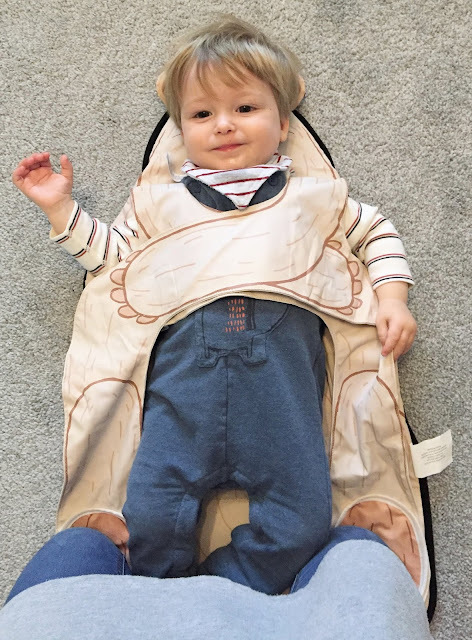 This Omni 360 Cool air mesh gives four different caring options and can be worn from birth to 48 months another extremely useful feature is it can be washed in your washing machine for easy cleaning too. 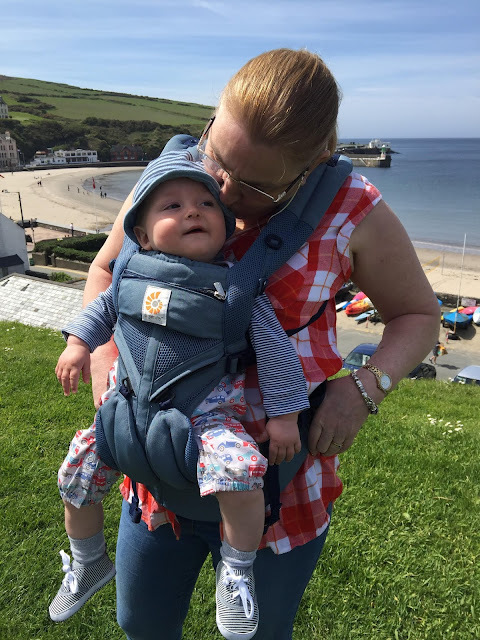 I decided to choose the Cool Air mesh 360 because I felt it would give me the most out of the carrier in terms of ways of wearing and the breathable fabric prevents mum and baby getting to hot when in use. 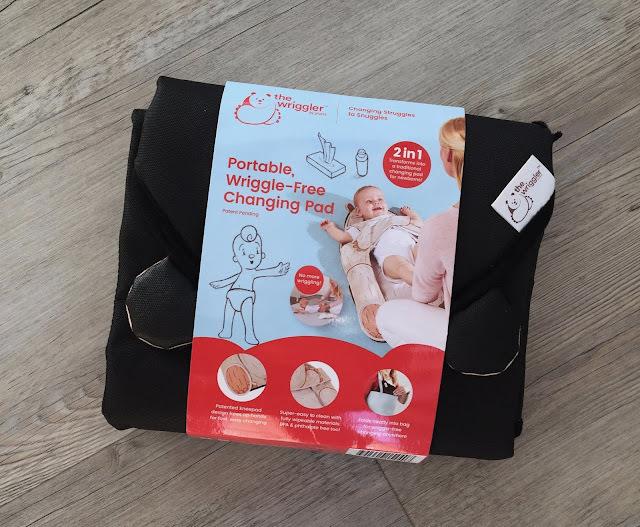 I found this very useful as other carriers in the past had made my stomach and baby get sweaty which isn't practical when wearing for a while. The Omni 360 cool air mesh carrier is also great if you are breastfeeding, which I am, as you can feed while baby is in the carrier if they get restless. The carrier was very helpful around the airport while waiting for our flight as I didn't need to worry about a stroller to push. I love that I can be hands free and know that Ethan is safe and with me all the time. This was handy with security and getting on and off the plane so my hands were free to hand over documents and passports. 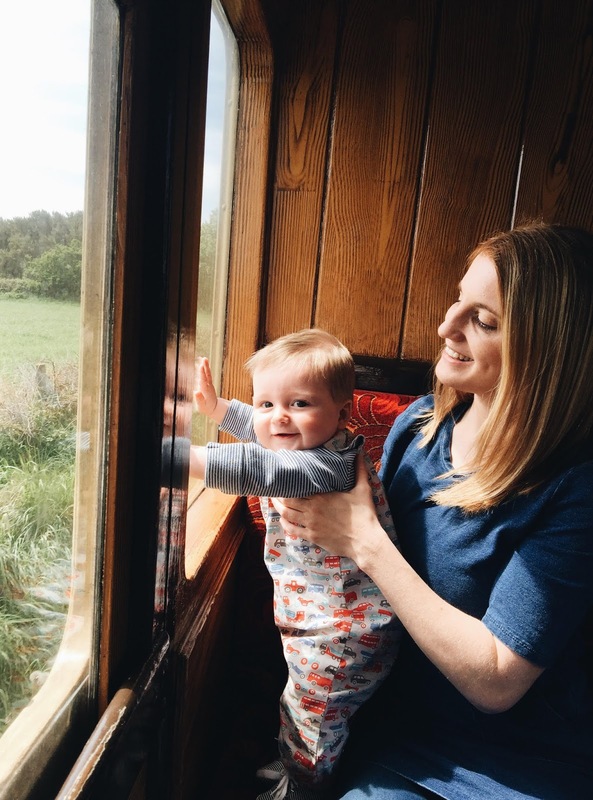 While at my mums we went on a steam train adventure and my mum loved wearing Ethan and said how comfortable the carrier was even with her bad back. The lower back support is in just the right place to support your back while carrying the baby. 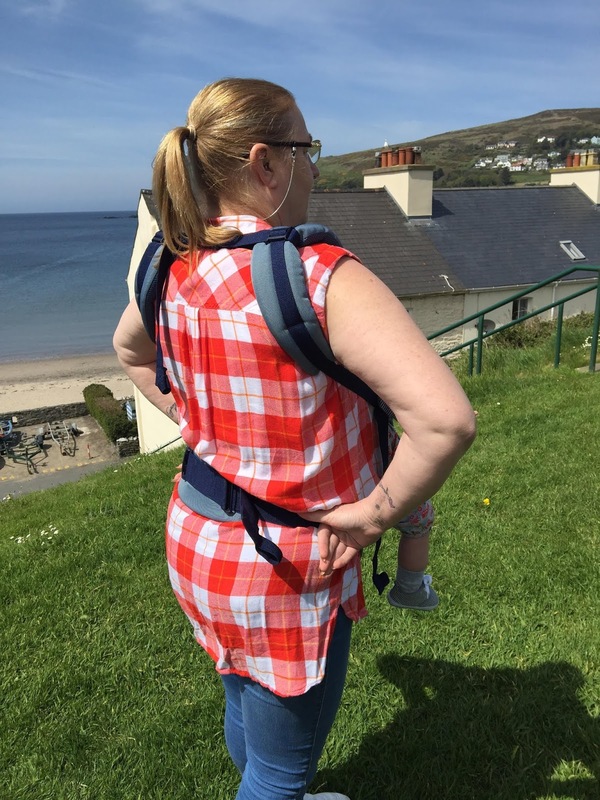 The shoulder straps can also be crossed over to add extra comfort and support if needed. When your baby's in the carrier it is important for their heads to be under your chin and so you can kiss their head comfortably. 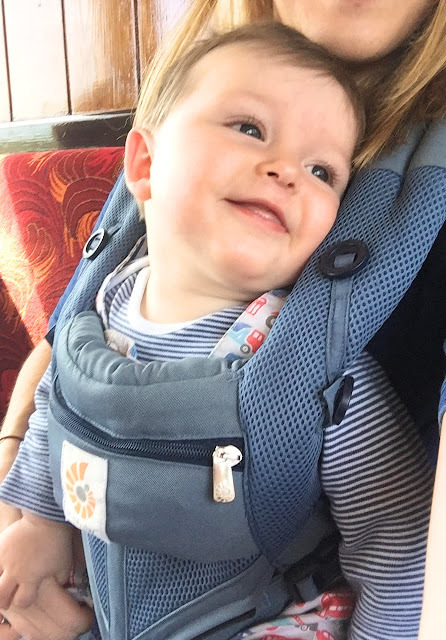 The front of the carrier has two sliders which allow you to change how you wear your baby. If the sliders are down like this then baby is to be worn facing out and then if you want to wear baby facing inwards or on your back then the sliders need to be pushed up to form a seat to hold your baby. You can also wear the Omni 360 cool air mesh on the side to which is another feature. There is a safety loop for the clip to go through when clipping the waist belt in place to help with safety. The strap is clipped together for shoulder support and then the two side straps are pulled to tighten the carrier in to place. 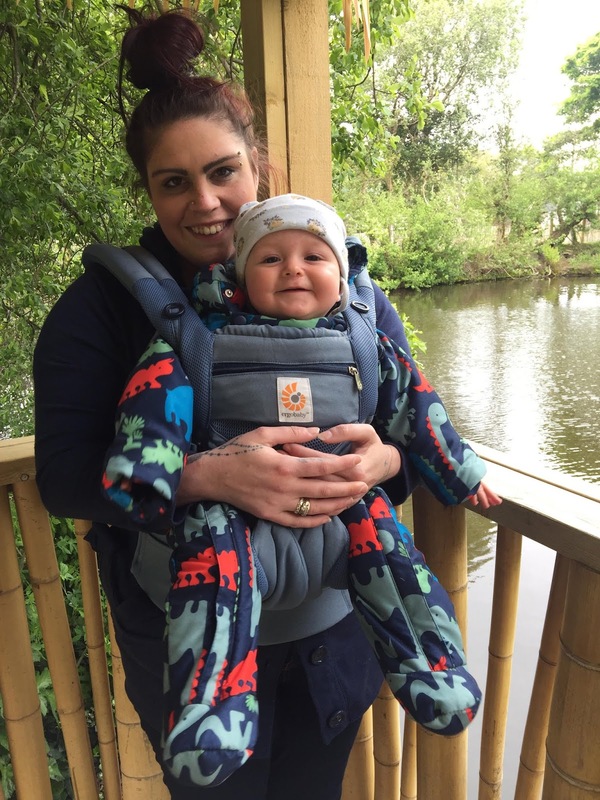 On the front there is a zip pouch with has a factor 50+ sunshade which can be clipped to the poppers on the shoulder pads to help protect your baby when on your back or frontward facing. Also worth knowing, you can only wear your baby forward facing from 5 months onwards. Inside the front of the carrier there is an extra cushion which can be folded out when wearing baby like this or forward facing and clips on to the black buttons at the side. The cool air mesh really helped on this cooler day when Ethan and my sister were wearing a few more layers. They both stayed at a comfortable temperature while at the wild life park and clearly enjoyed each others company. 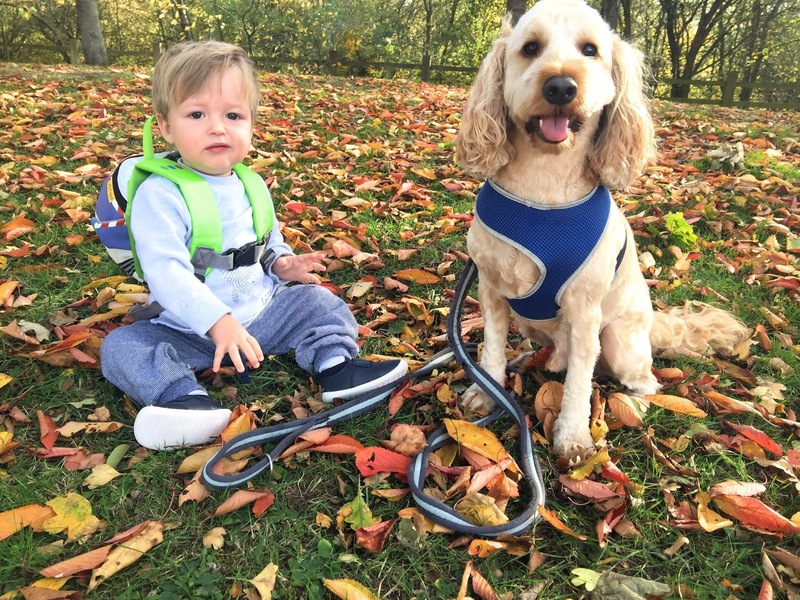 The Omni 360 Cool air mesh carrier also comes with this handy pouch that velcro to the lap belt under where the baby is seated. I found I could not access the stuff inside with Ethan was outward facing so found it easier carrying the pouch separate. It was handy for flight documents and passport and my phone for easy use. There is also a front pocket you can slip things in to but I liked the zip compartment for keeping things safe. Disclosure* I received this product as part of a collaboration all opinions of the brand are my own. Copyright 2016 BeautyBottle. Images taken by myself. Simple theme. Theme images by Ollustrator. Powered by Blogger.